In your fight against migraines, are you making any headway? 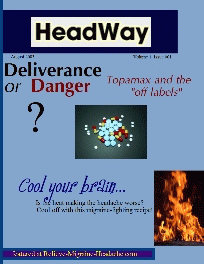 The latest headache news and the best headache remedies - HeadWay! Are you making any headway in your fight against headaches? Sometimes in the fight against migraine, a little bit of this and a little bit of that is all it takes to make all the difference! 1.New research – every day breakthroughs are being made – new medications, new herbal discoveries, a better understanding of what's causing your headache. What was the best remedy 3 years ago may now be history. But now you can keep up with the facts! 2.Tried and true remedies - everyone has their own headache remedy or medication that works for them. But after many years of headaches and research, I'm still finding helpful tips that someone else has been using for ages! Every little step may bring you closer to a headache-free life! Why not start making headway with HeadWay? So take a moment to subscribe below, and all the best as you fight to make your head pain free!